Around 1895, a prominent Quebec architect, Ludger Lumieux, designed what is now the Elpro building. Lumieux also designed several notable structures in St-Henri and is best known for the Atwater market and the St-Henri fire station. Its proximity to the Lachine Canal and rail transport has made St-Henri an attractive place for manufacturers. The Tooke brothers, who made shirts and collars, opened in the 1890s and created more than 600 jobs. St-Henri never fully recovered from the depression of the 1930s. The Tooke brothers decided to move their business to Cap-de-la Madeleine allowing another shirt manufacturer, Grover, to open its doors. In 1986, the Grover building was sold to another manufacturer of leather products known as Elpro International Inc. In the early 1990s, Elpro International Inc. became a leading importer of handbags and handbags. luggage. In May 2012, Elpro International Inc. closed after 60 years of business. 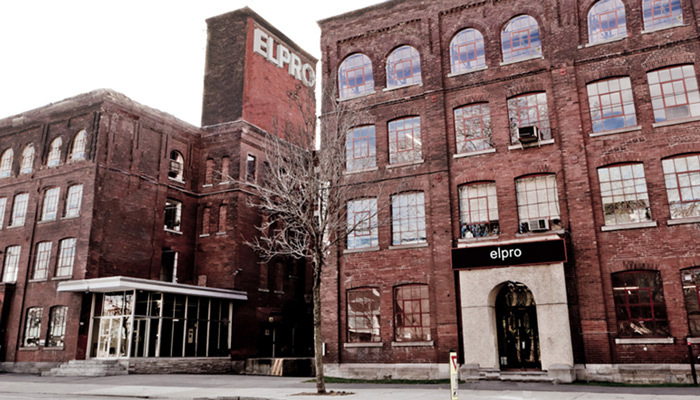 The Elpro building has been transformed into a commercial loft . The exposed bricks, original wood floors and high ceilings, are all features that highlight its exceptional heritage value, and character. St-Henri goes through a renaissance and quickly becomes a neighborhood with a promising future. Located near the city center and surrounded by services, the Elpro building is the ideal place to build your business.